For the people who collect and carry water — usually women and children — water scarcity can mean traveling long distances in search of water. 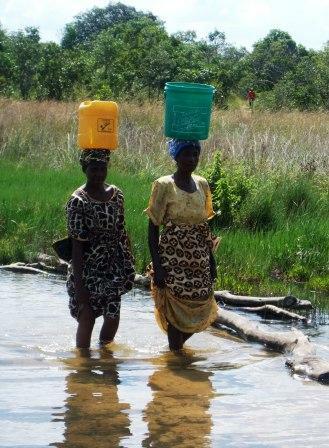 Collecting and carrying water over long distances causes many health problems. For farmers, water scarcity means hunger when drought causes crops to fail. For children, water scarcity can mean dehydration and death. In hospitals, clinics, and other places where sick people get care, lack of water for washing can allow infection to spread from person to person. A reliable supply of safe water can mean the difference between life and death. We need clean water to heal from many illnesses. Water is used to prevent and treat diarrhea. Washing hands with soap and water after using the toilet and before eating or handling food helps prevent diarrhoea illnesses. If there is not enough water for washing, there is much more risk of illness and death. This totals 15 to 20 litres per person per day. But many people are forced to manage with much less. Other needs, such as sanitation, irrigation and watering livestock often require much more water than drinking, cooking, and washing. Community places such as schools and health centres may need more than the average amount of water used by one person in a household. Health centres, for example, should have at least 40 to 60 litres of water per day available for every person served. Health problems from water scarcity or germs in water can be especially dangerous to people who are already affected by chronic or life-threatening illnesses such as HIV/AIDS. But governments and organizations in areas with high rates of HIV may be less able to meet community water and sanitation needs because they must use scarce resources to care for the HIV crisis, and because they may lose workers to the disease. The HIV/AIDS disease is NOT passed from person to person through water. But lack of clean water to wash and sterilize health care instruments in hospitals and health centres can make prevention of the HIV disease more difficult. When people’s bodily defenses are weak from HIV, diarrhea diseases are more likely to affect them and it is much harder to recover. Infants and children infected by HIV are especially vulnerable. Worms that might not be life-threatening for people who are otherwise healthy can cause pneumonia if they travel into the lungs of HIV-infected people. People taking drugs for HIV may have complications when taking other drugs to treat diarrhea and worms. It is important for people with HIV to have access to safe drinking and washing water near the home, as well as water for gardening, raising animals, and other home-based activities. People with HIV may be too weak to collect and carry water. Households headed by children or elderly people may be left out of decision making, leaving their needs for water and sanitation unmet. Women are the main caretakers for people with HIV as well as being heavily affected by the disease itself. When they are also responsible for collecting and treating water, the burden of work becomes too much. HIV leads to increased poverty because it costs money to take care of the sick and because there are fewer people working to earn money for the family. This makes it much harder to pay water fees. Health workers, water and sanitation promoters, and caregivers all need training about water and sanitation-related infections and how to keep people with HIV/AIDS safe. People with HIV, their caregivers, and children, women, and elders left behind by people who have died, need to be included in planning for water projects. When water security is respected as a human right, the most vulnerable people in the community will have their needs met and everyone will be safer and healthier. What steps can we take towards improving our water supply? Depending on your local situation, water supplies can be increased by techniques such as rainwater harvesting, digging wells or transporting water to your village in a pipe. The first step is to join together to assess the water supply where you live and develop a plan for community water security. It is also important to make sure your community is aware of health problems that come from drinking unsafe water.